AT&T’s “Gifts of Galaxy” promotion, introduced on Cyber Monday with a complimentary Samsung 50-inch 4K UHD TV for Galaxy Note 9, S9, S9+, and S8 Active buyers, is far from over, although that incredibly valuable freebie is no longer available. Those who will choose to purchase one of the high-end smartphones listed above on an AT&T Next or AT&T Next Every Year installment agreement today are instead looking at a gratis Samsung Wireless Charger Duo. That’s not quite as eye-catching and expensive as a massive ultra-high-definition television, but it still separately costs $119.99. The discount is certainly nothing to sneeze at, especially when you don't need to meet too many conditions and special requirements. You only have to take into consideration the aforementioned monthly payment plan stipulation, as well as obligatory activation of new AT&T service or the addition of a new line to an existing customer account. 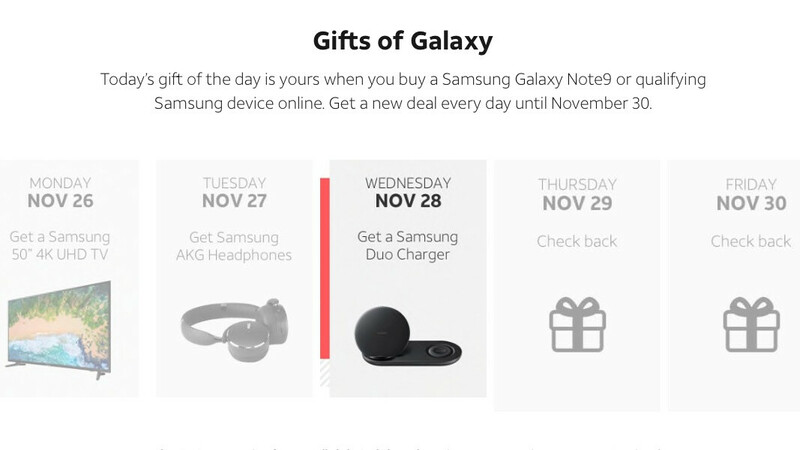 Within 14 days of your “eligible” purchase, which remember, includes the Galaxy S9, S9+, and Galaxy S8 Active apart from the hot new Galaxy Note 9, you should receive gift redemption instructions by email. You will then get an extra 30 days to actually claim your free Wireless Charger Duo on Samsung.com with a one-time use promo code. That doesn’t sound too complicated, and although it’s been raining sweet Black Friday and Cyber Monday deals on the Galaxy Note 9 and other top-notch Samsung handsets, there aren’t many special offers left right now. What’s even better about AT&T’s Gifts of Galaxy program is that it’s stackable with the carrier’s routine BOGO deal. That means you can get both a second Galaxy S9 unit and a Wireless Charger Duo for free with the purchase of one great Samsung phone.